Above: Photos I took in the tulip red light district (aka the flower boarder). Last weekend we had a mini Spring heatwave here in the UK with temperatures reaching as high as 24° in some parts of the country - which is almost unheard of at this time of year. Of course, at the first sign of the sun we were all out in our sandals, summer dresses, vest tops and shorts - well, we have to take every oportunity we get, that might be the most sun we get this year! Other than the unexpected burst of Summer in Spring-time, what surprised me the most was how our little tulips responded to the heat and light. 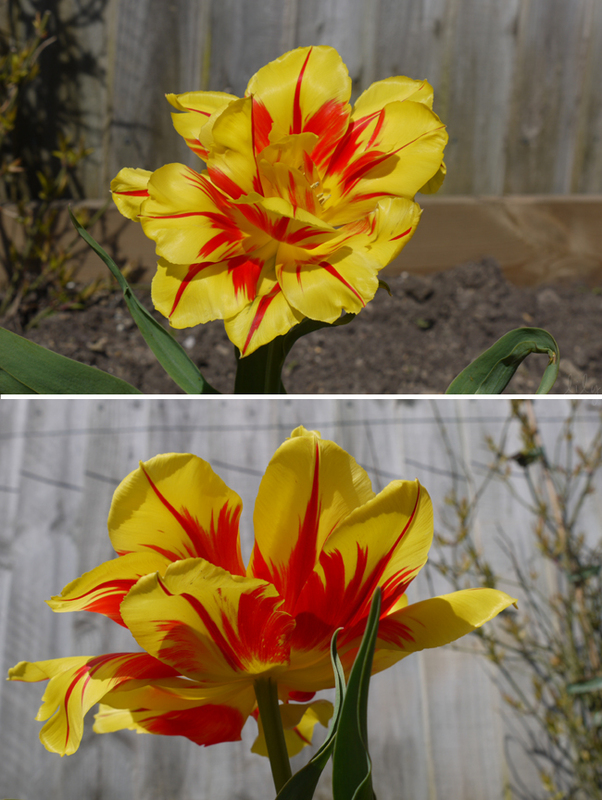 I knew tulips wilted at night and revived again when the light returned, but until now I was completely unaware just what utter light-tarts they were! I stepped out into the garden and BAM, the tulips were wide open, laying it all on a plate for the sun. Who knew they could burst open so wide?! Later, as the sun disappeared behind the trees, the flowers returned to their typical closed tulip state. But their display left me feeling strangely more fond of the little flowers... like us Brits, they take the sun when they can get it, and their constant state changes depending on the light is a perfect reminder that flowers are actually living things. Roll on summer!